ENDOMETRIOSIS is a chronic disease that affects 6-10 per cent of the general female population, but often goes undiagnosed for a long period. 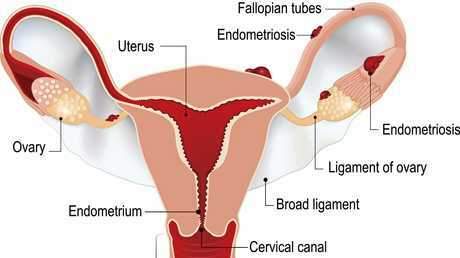 It occurs when parts of the lining of the uterus (the endometrium) develop outside the uterus and on surrounding organs such as the bladder, ovaries and the Pouch of Douglas. Symptoms include severe period pain, heavy menstrual bleeding, bloating, weight gain and bowel or bladder problems. Warwick local Madison Burton recently spoke about her three-year battle to figure out what was wrong with her before a gynaecologist finally diagnosed her with endometriosis. Condamine Medical Centre doctor Bronwyn Bryant said the only way to diagnose endometriosis was through surgery and as a result, many women suffered with the condition for a long time without knowing. "It is often diagnosed when people are trying to have a baby and unable to fall pregnant," Dr Bryant said. Little is understood about what causes the disease in some women, and Dr Bryant said many didn't realise how severe the disease could be. "I think there is certainly a lack of awareness of how debilitating the condition can be for some people, but there seems to be a great variance in how severely different patients are affected by endometriosis," she said. Treatment includes surgical removal of misplaced endometrium, some sort of contraception like the pill to regulate hormones and medication to stop the endometrium growing back. Dr Bryant said it was difficult to get a diagnosis or treatment for the disease through the public health system, and anyone who is experiencing symptoms should see their GP and invest in private health insurance. "Endometriosis does tend to recur over time and every time you have the operation increases the risk of complications."